So let me answer those for you. The book has been written with one clear objective. To explain how and why the currency markets move in the way they do – the forces, the factors and the manipulators.Many aspiring traders, simply do not realize that the forex market sits at the heart of the financial world, which when you think about it logically, is really common sense. After all, this is the biggest money market in the world, and if the financial markets are about one thing, they are about money. Making it, protecting it, or increasing the return. It’s no surprise therefore, the forex market connects all the others. Put simply, the forex market is the ultimate barometer of risk. It really is that simple. And yet, how many forex traders ever consider associated markets? And the answer is very few. After reading the book, you will be one of those enlightened traders who truly understands money flow and risk, and your confidence as a trader will grow exponentially as a result.The next thing you will learn is that trading in one dimension or using one trading technique, is rather limiting. You have probably met people who trade, who then make a bold statement such as: ‘I only trade using the fundamentals’ or perhaps that ‘technical analysis is a self fulfilling prophecy’. 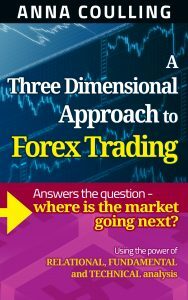 To trade successfully in the forex world requires a three dimensional approach which embraces the fundamental, the relational and the technical and is what this book is all about.